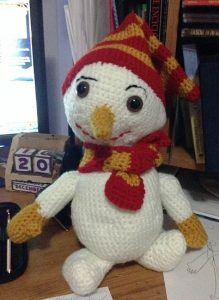 I put a lot of effort into my Amigurumi pattern and try to write it down as understandable as possible and I also make a lot of pictures. 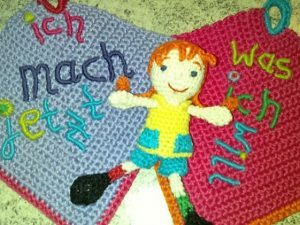 I wonder each time, whether this is understandable enough and I always hope that you try the pattern and that you are able to crochet them without major problems. 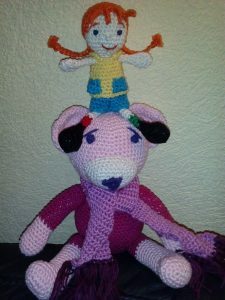 Every time I see an Amigurumi, which was made by using the patterns of amilovesgurumi, I am very excited. I present your work using my patterns on this side and hope that you have a lot of fun looking around in the Amilovesgurumi Gallery. Each piece you see here is unique. Some of you have changed a bit here and there and it’s really interesting to see how you put your own style and ideas to your amigurumi and even improved the pattern. Thank you so much for your pictures and I would be very happy if you send me your picture of your amigurumi! Just email to k.godinez@gmx.de – and thank you so much for sharing! 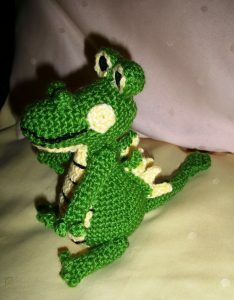 I have not yet translated the pattern for the dragon into English, but he is available in Spanish. 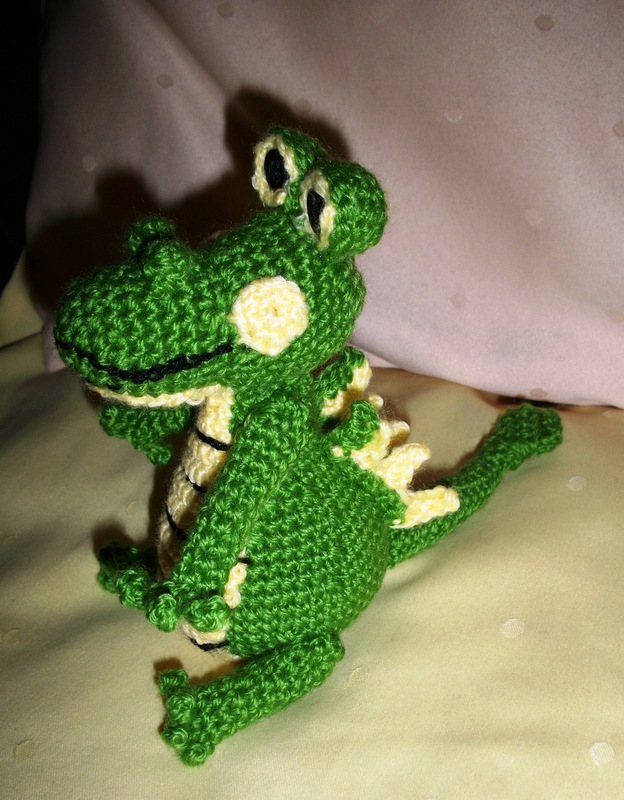 He is one of my first larger Amigurumi and I got the inspiration from the German children’s book “Der Pupsdrache Lutz” by Kathrin Hamann. 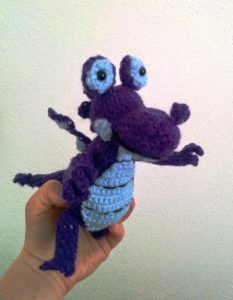 Ulli from Germany made this marvelous dragon and I think her color combination is very well done! Adorable! 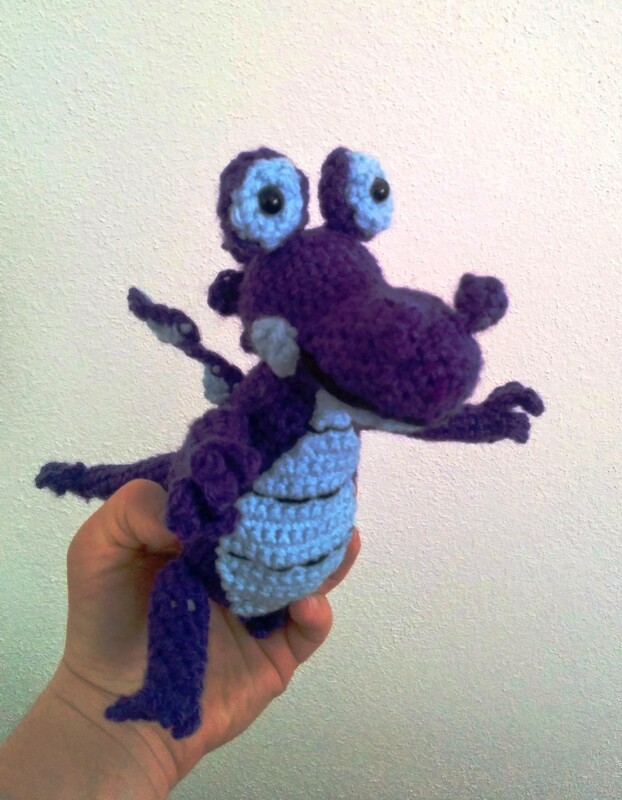 Monika from Germany made the dragon for a family friend. 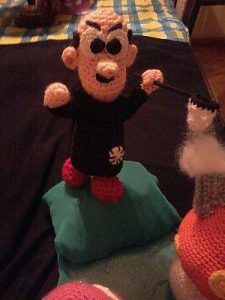 I’m sure he was very happy about this Amigurumi! What a cute little Dragon! 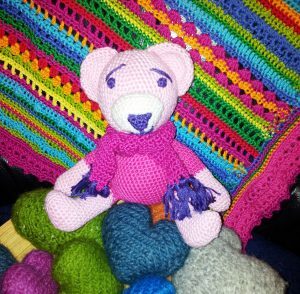 Andrea made the Teddy for her daughter. The daughter needed a Teddy for the 20th birthday!!! for her best friend. Since Andrea had only a weekend available and all shops had already closed, she crocheted him from wool she had at home. She took rose and pink and I think the result is very sweet, you want to hug the little one immediately! 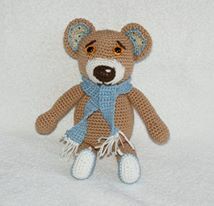 Kerstin from Germany made this adorable Teddy. I think the face is totally cute. Doesn’t he looks like as if he had done something wrong and now he is sorry? I wrote a short children’s story for the little snowman, which you can download as a PDF-download here. 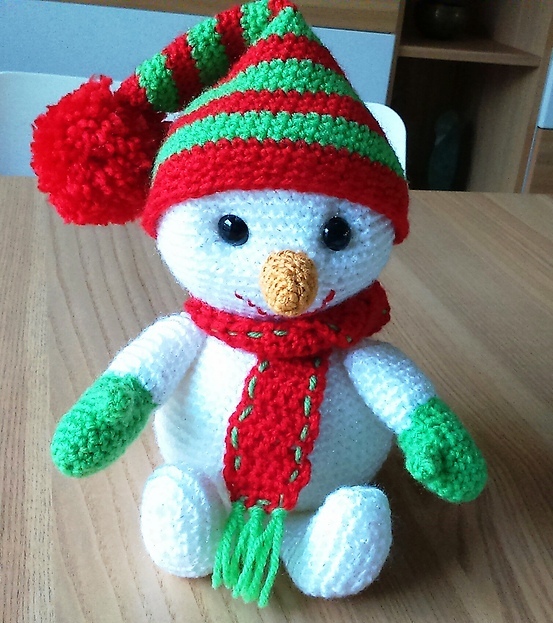 The snowman was very popular and for the first time I had a lot of visitors on my blog. 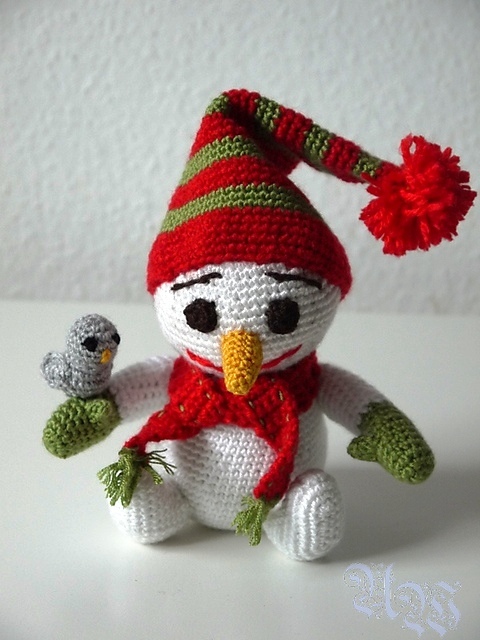 Ursula from Germany has crocheted this little guy for herself. She wrote me that she crochets only those Amigurumi that she likes right away (Love at first sight). I loved this snowman immediately! This cute snowman was crocheted by Kathy from Tacoma, Washington. She made him as a gift for her son. She made the hat, scarf, and gloves in Gryffindor colors from Harry Potter, which her family are huge fans of. A fantastic idea! 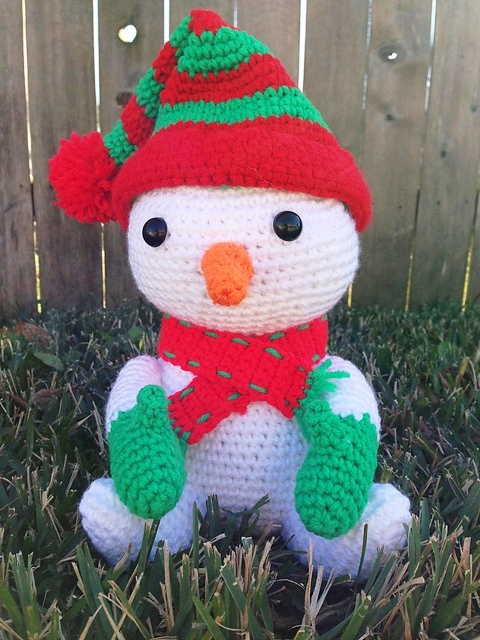 Michelle from Texas made the little snow man to accompany a gift card for her daughters third grade teacher. She said it made a perfect Christmas gift and the teacher loved it! I also love your snowman, he looks so sweet! 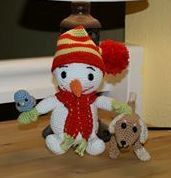 Kerstin from Germany made the whole set, with snowman, bird and dog, and when I saw the picture, I was very happy about it. Wonderful and magical! I made the snowman for my mom as a present, since she loves snowmen and has a collection. I used an H hook to make it larger and have been so thrilled with the pattern. 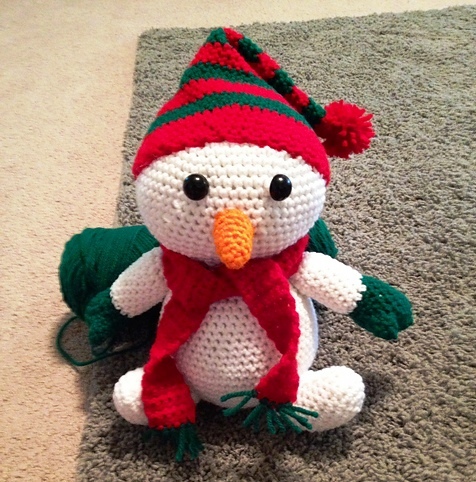 Dear kjuliet91, I’m excited about your snowman! A documentary film on TV, that showed the life of lemurs on the island of Madagascar, inspired me to crochet a lemur. I was very impressed by the beauty and grace of these animals! 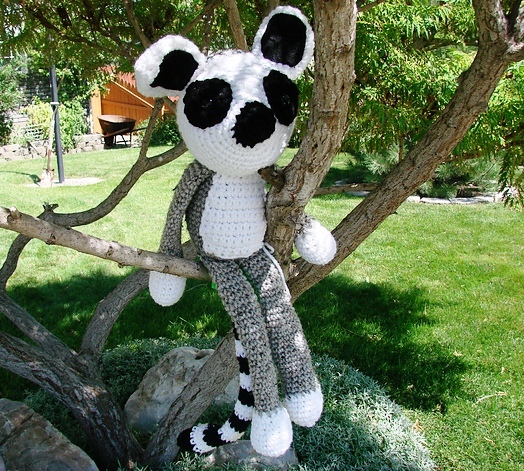 Roxy from the United States made the lemur for her future son-in-law, which is an US Marine. 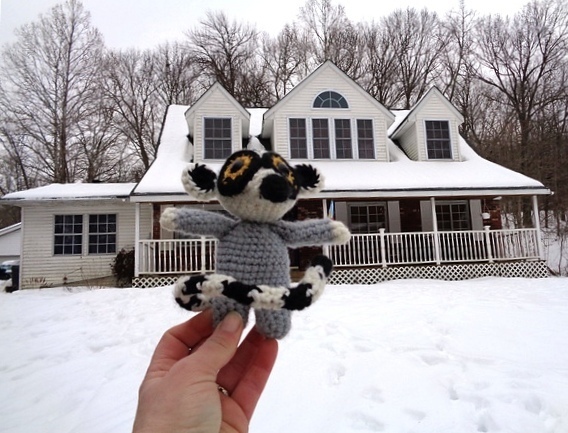 Before she mailed it, she took a picture in front of her house; she thought the snow would make him smile (it is hot where he’s stationed). Well, I think her lemur is hot! Great work! Jennifer from Germany sent me a sweet picture and she wrote that this has become the greatest of her Amigurumi. Wow, it is really very well done! 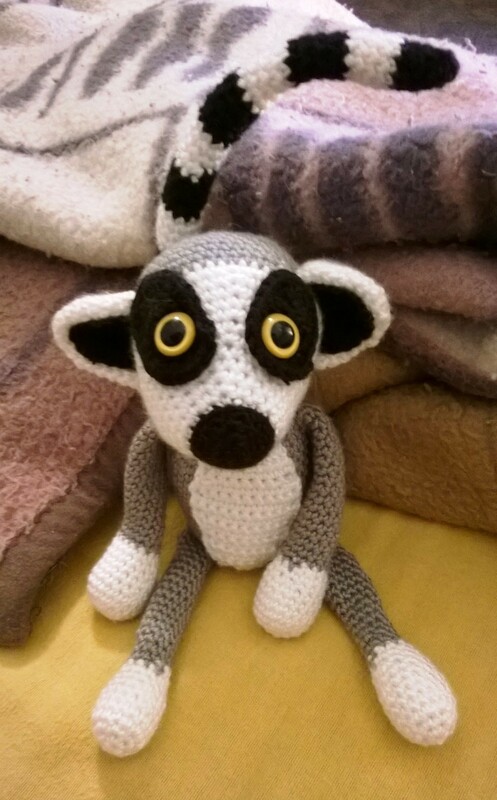 A very talented crocheter made this nice looking lemur which was sold to raise money for the Homeless Pet Shelter. She made the tail a little bit longer and I think it looks great! 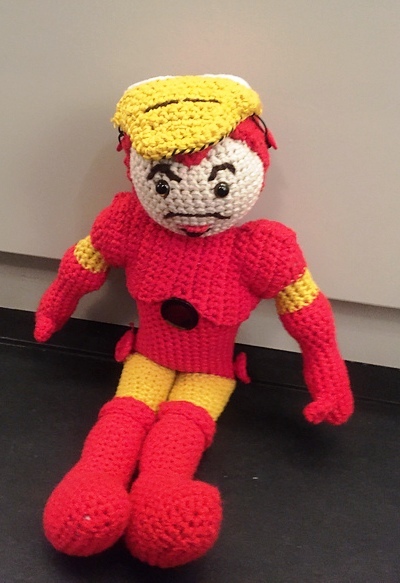 It was just the right wish at the right time for an Iron Man, from a sweet little girl. I personally would not have come up with this idea! 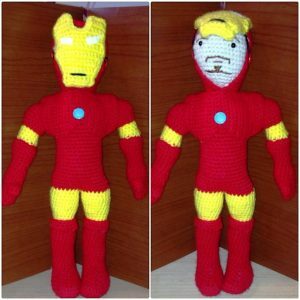 Before I started crocheting, I watched all the movies to understand what it is all about and who stands behind the figure. And I must say: Tony Stark thrilled me! 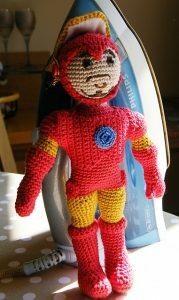 Yasmine from Belgium made the Iron Man for her little guy Siebe, who’s 5 years old. 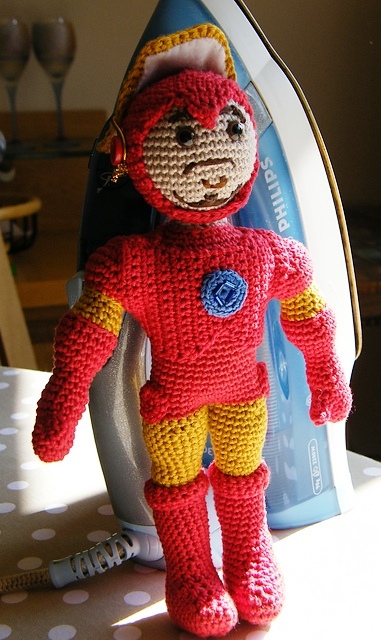 Her son specifically wanted to have a really big Iron Man – which was a challenge for her (it’s 43 cm /17 inches high! 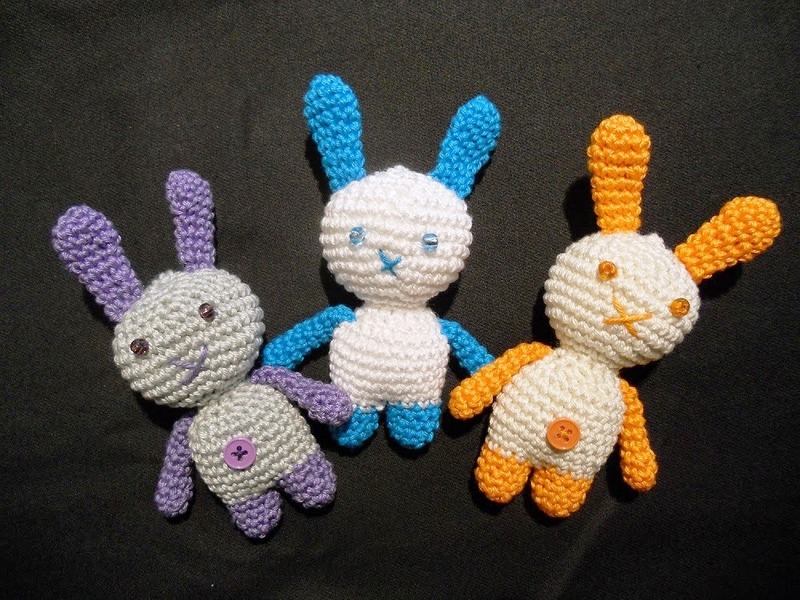 ), she normally makes smaller kind of amigurumis, so this was the first time for her to take the yarns double (with a 4mm hook). She made the mask a little bit bigger, since it didn’t cover all of the face. Her little guy is very happy with it, and she wrote that together they enjoy a lot of adventures. Wonderful work and I love his size!!! Amie from New Plymouth, Taranaki, New Zealand made the Iron Man for herself, but then a cousin of her saw him and went absolute nuts over him, so she ended up passing this wonderful amigurumi to him. She wrote that it is kinda hard to say no to and just as big of a fan of iron man as her. She plans on making another one, when she finds time for it! I’m sure that this terrific and generous gift brightened his day! We’re kids at heart” and that’s exactly what I feel. I just had to add this one! Stunning! 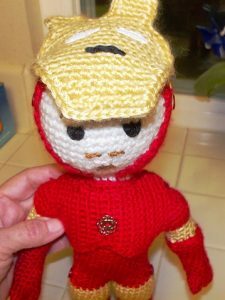 Caty from Palmer, Alaska, made the Iron Man for her nephew who lives in Florida. She wanted to make something special for him to hug on since she can’t be there. Caty said that my pattern was wonderful and easy to follow. He looks great and I’m sure her nephew is very happy with him! Denise from Simi Valley, United States, made her Iron Man for her grandson. Her grandson loves Iron Man, he even had worn a costume from him for Halloween. 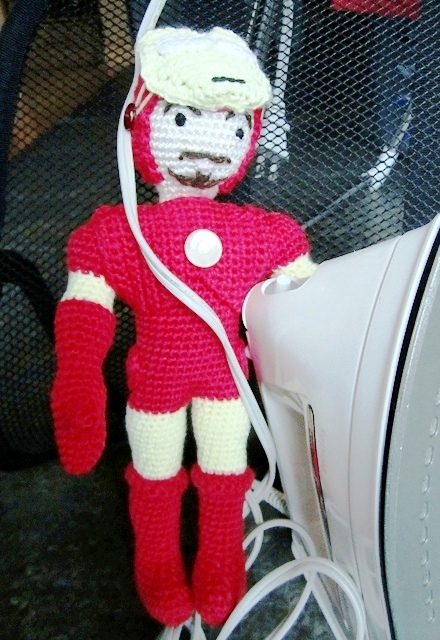 Denise liked the Iron Man, she said, he came out so well even with a removable mask. She has my respect for her Iron Man, he is well done and gorgeous! Rania from Alexandria/Egypt made a complete village with the smurfs. She wrote me that the reason she made the scene is that the smurfs cartoon was one of the cartoons, she and her sisters grew up watching it. 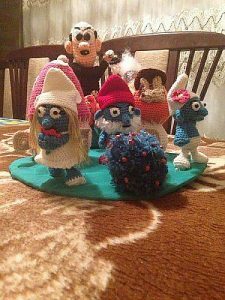 All her family loves this cartoon and she thought to surprise them all and crochet a smurfs scene with Gargamel chasing the poor little smurfs. Great work! Meaella wrote that it was super easy to make Gargamel from the pattern! 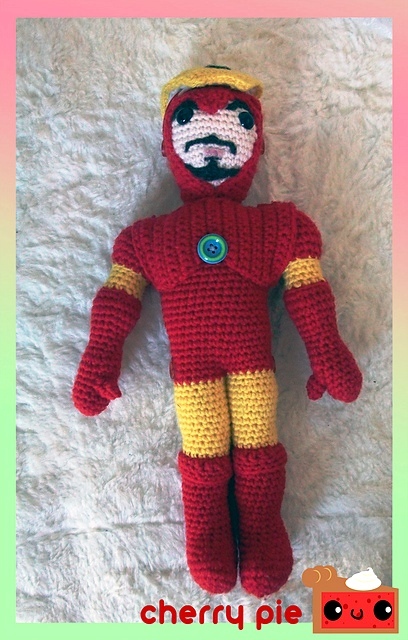 She made him for her grandson and he loves it very much! 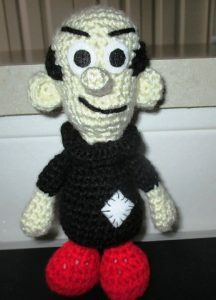 I think Gargamel is adorable and I love his face, he looks like as if he is just in front of the cat! This time I was working together with my husband: I wrote a story for the Easter Bunnies and he made the Easter Bunny School. I was so happy, when I finally had this “school”. But I had to wait over a week until I was able to photograph the Bunny School because it was March and it was raining every day. The pictures and the story you can find here. Have fun with it! For Valentine’s Day I crocheted an envelope for your romantic message. 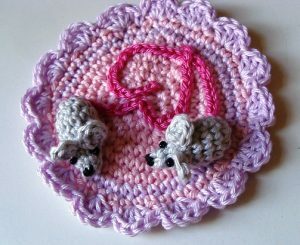 There are two variations – an envelope with roses and two mice forming a heart with their tails. 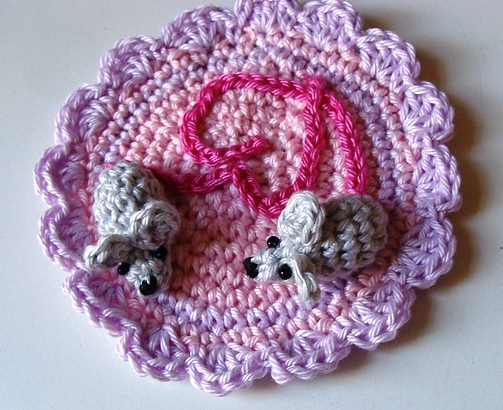 Inge from Belgium crocheted the mice as a decoration for the house. They are very, very sweet! I love the story of the Three Little Pigs and the Wolf, and I have changed it a little bit. You can find the funny story here. I found the movie was entertaining with some very good scenes. It was just a little bit difficult during the development. 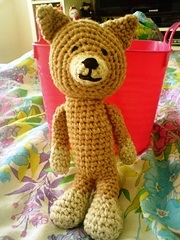 I had crocheted him to the middle of the head, but then I looked at the legs and I didn’t like them anymore. So I started to crochet all again and to improve the legs. The same drama then later with the belly (I had just finished the head). 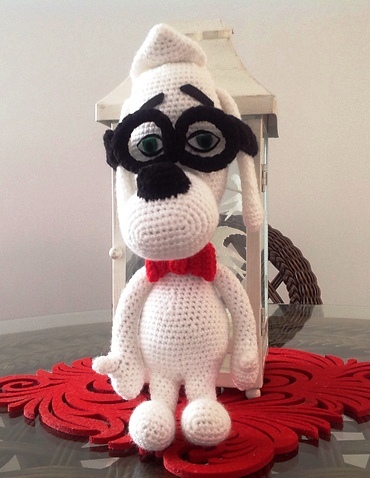 I think I’ve unraveled Mr. Peabody more than any other Amigurumi. 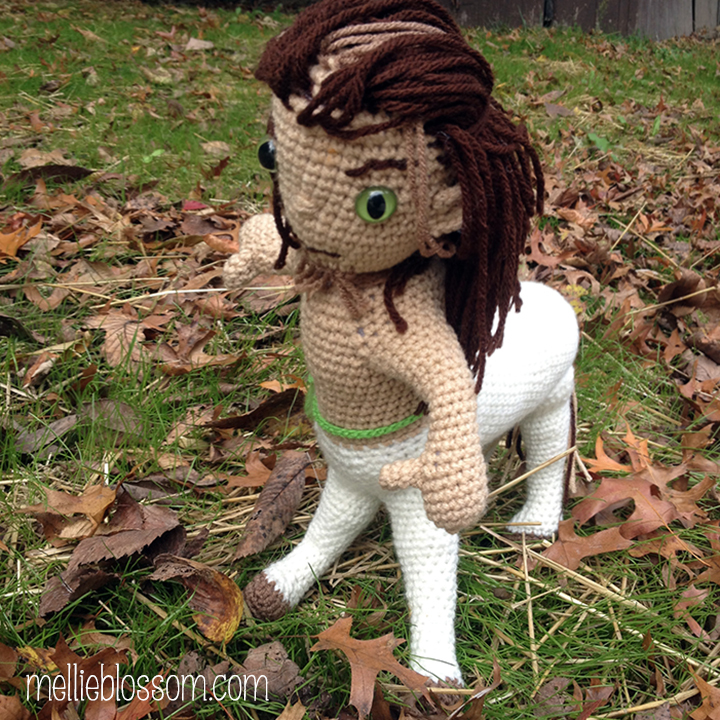 Nevertheless, he is now my favorite Amigurumi! Sandra from Kallangur Queensland, Australia, made Mr. Peabody for her Grandson James, who was 5 years old at the time. She said, he just loves him. 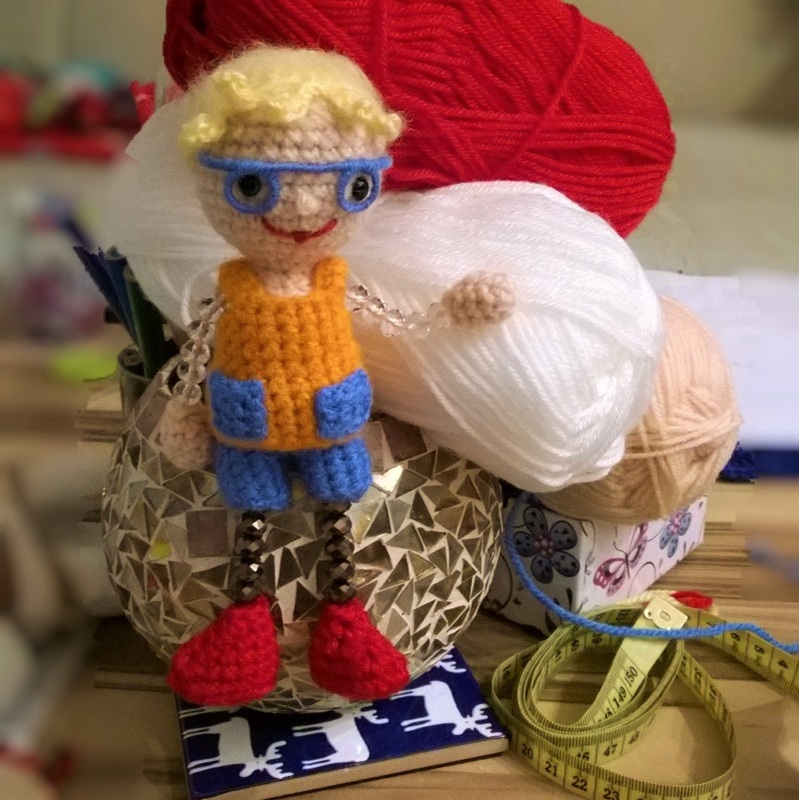 Sandra loved the way the pattern came together and how much he looks exactly like Mr Peabody. She also loved all the details especially his eyes and glasses. Excellent work and a beautiful picture! The idea for a Cheiron came from my friend Nic. She has often helped me with the English revision of my stories and made something special out of them. I asked her once if she would like to write a few own lines on my blog and then she sent me a story about a Cheiron. I wondered if I could make such a difficult character, but in the end I accepted the challenge. Marianne Efinger, a children’s book author, wrote a children’s story for my blog and all amigurumi fans. The story is about a crab which is quite unhappy about her shell and an octopus, who wishes to help her. After she sent me the story, I googled for crabs and octopuses pictures and made a few sketches, because until then I was not quite sure how they exactly look like. I wanted to crochet the crab and the octopus as realistic as possible, but still in a lovely design for children. I hope, I have reached this goal. Here you can find the children’s story: Crab Coconut Part 1 and Part 2. 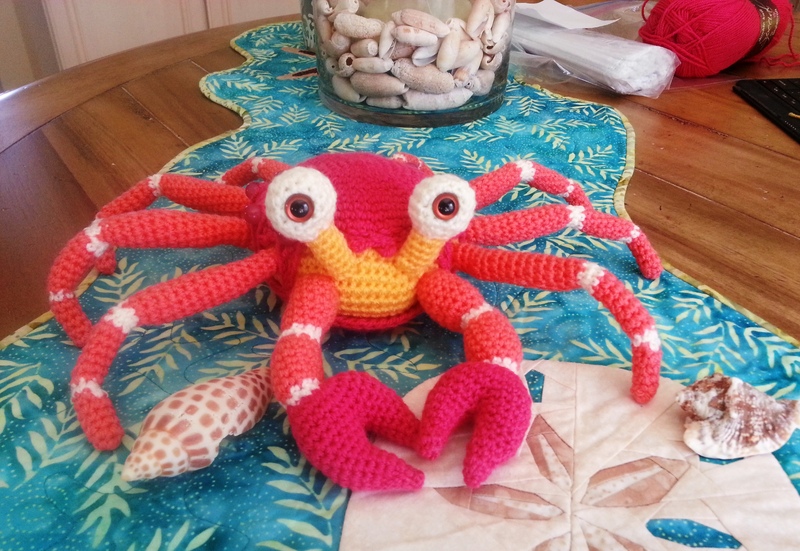 Peggy made the crab and she also made the coconut shell for her sister. When she went to Marco Island Florida, she often saw crabs and octopi on the beach. 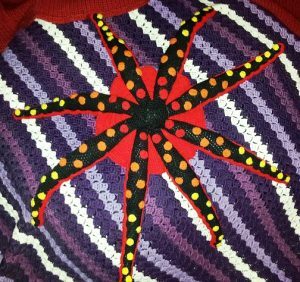 Peggy also want to make the Octopus and I can’t wait to see that picture. I love her cute crab, she looks like she is alive! Glenda from Lansing, Michigan, said that she made it for a friend of her who lives in a area of the USA that is known for blue and other soft shell crabs. She also plans to make Octopus Paul and all the accessories. Her crab looks gorgeous with the blue colors and I’m curious what colors she will use for the Octopus. 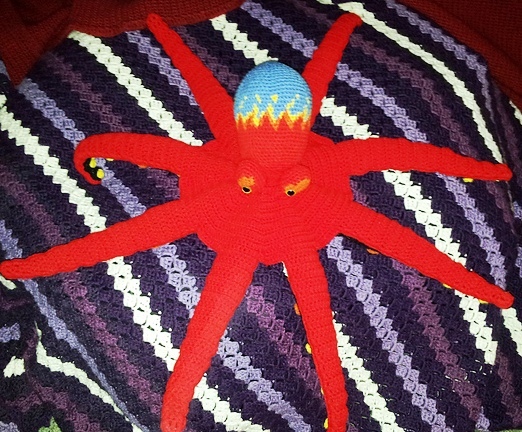 Daniela from Germany calls her octopus “Admiral”. 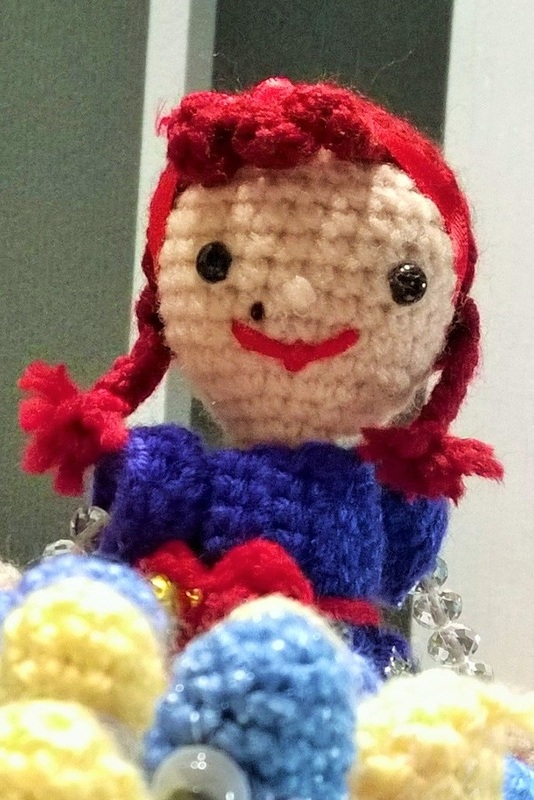 Just recently she has learned how to crochet. She decided to try it with this pattern, which is not really an easy pattern. Beginners can do absolutely beautiful work! 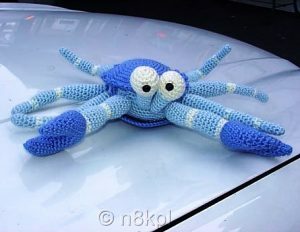 She want to crochet another octopus in pink and I’m sure this will be a great eye catcher. 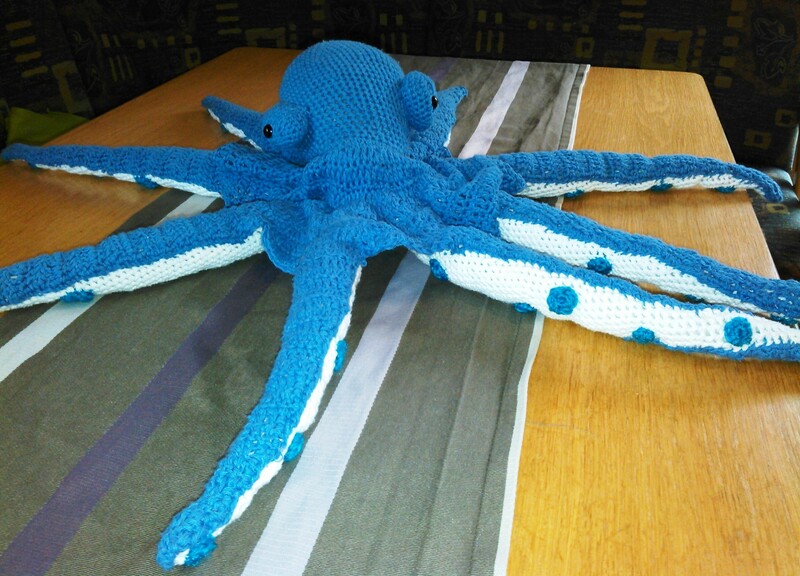 Tiffany from USA made this octopus for her 7 year old nephew. He asked for an octopus with flames because his teacher had made computerized flaming sea creatures for the bottom of school papers and that gave him the idea. Tiffany said that it was a little bit of work adding all the “suckers” but her nephew LOVES it! It is such a great and wonderful idea and when I saw the octopus the first time I felt in love with this piece of art. 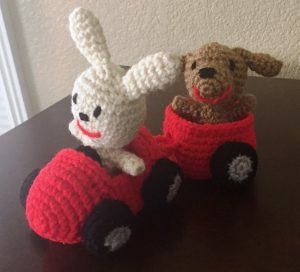 Sandy made the Eggmobile and the Mini-Babies for her grandson. She said, he loves animals, so she put a mini-doggy and a bunny inside and gave them big smiles on their faces. Sandy has changed the height of the trailer a bit and I think it looks even better. I’m sure her grandson loves to play with them. For Miniami series I have crocheted for the first time small pieces of furniture. It is a bigger project and every now and then I’ll crochet something for the house. The stability is the biggest problem. A piece of furniture has straight sides and must be stable – which is a challenge with the stuffed and crocheted amigurumi. Andrea from Germany sent me this sweet image. 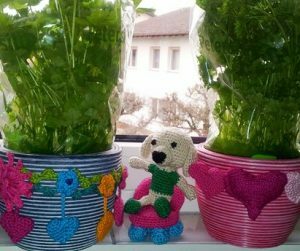 Her daughter wanted herb pots for her windowsill. Andrea also made the dog and the chair and it was a unique Easter gift. Great job and the pots are also very beautiful! 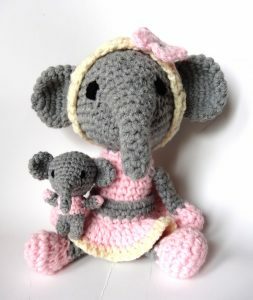 Nina from Greece crocheted this beautiful elephant with a mini-baby. Great work, I felt in love with mom and baby! I wanted to see how a Amigurumi-doll looks like with pearls as arms and legs. 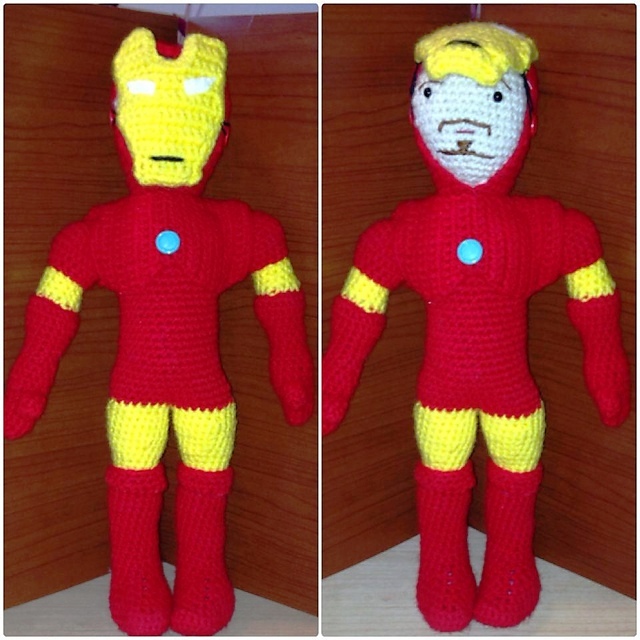 You can make them very fast because you don’t need to crochet arms or legs. They turned out so funny that I have crocheted a whole set of them. 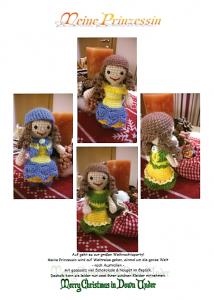 Mandy from Germany made these dolls. 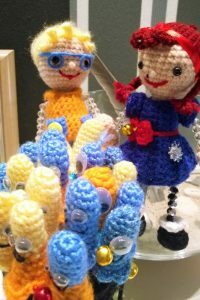 She combined various instructions, she added blond hair and glasses to the doll and the second one is even pierced and tattooed! 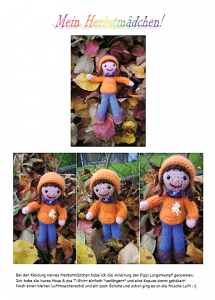 She crocheted the dolls for a Halloween kindergarten party and wrote a wonderful story. 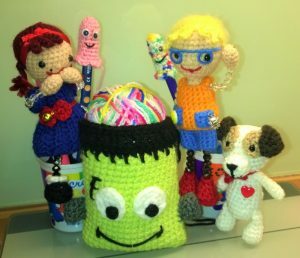 Then she crocheted for each child a “ghost”. Great idea and super sweet dolls!!! Andrea from Germany sent me her pictures with Pippi. 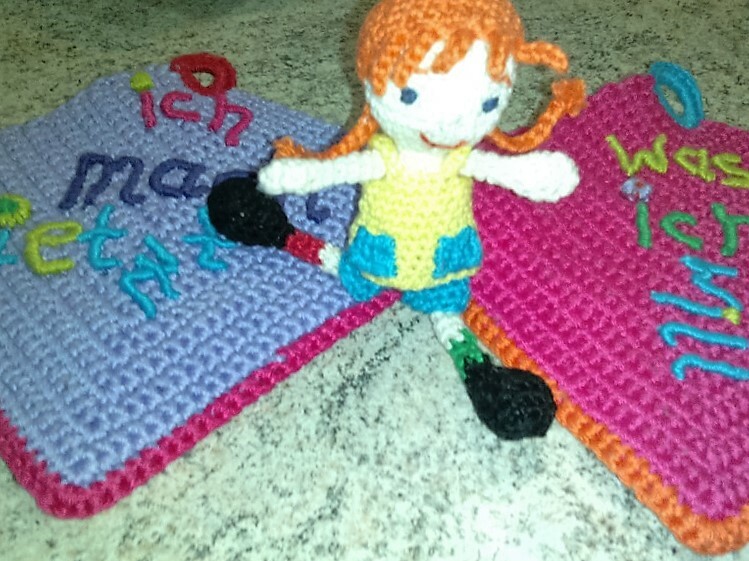 Because Pippi is originally a Bling Bling Doll, she crocheted arms and legs to it. Andrea also made a few beautiful potholders as a gift to the 18th birthday of the daughter of her boyfriend. I am sure that she will be delighted! Mandy from Thüringen sent me these wonderful pictures of the princess and the Autumn girl! Thank you dear Mandy, they are very well done. You have a wonderful talent to implement the patterns and make the dolls even more creative!